In Stewart Brand’s terrific work, “How Buildings Learn”, there are some great analogies to what we do in Enterprise Architecture. He expanded on the concept of “shearing layers” introduced by Robert V. O’Neill in his “A hierarchical concept of ecosystems”. The primary notion being that we can hierarchically understand our ecosystems better by understanding the different rates of change possible at the different layers. 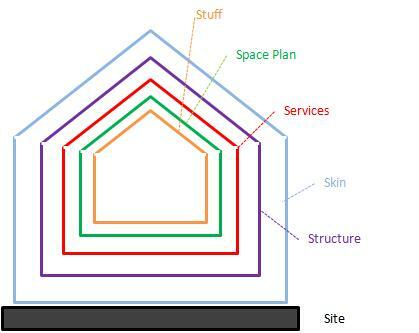 The diagram above is reproduced from How Buildings Learn, and represents the parts of a building which change at different rates. It is arranged from outside in with, in this representation, no absolute correlation between the parts and rate of change. The foundation and load bearing elements are perilous and expensive to change, so people don’t. These are the building. External surfaces can change more frequently than the structure of the building. Changes in fashion, energy cost, safety, etc. cause changes to be made to the skin. However tradition and preservation orders often inhibit changes to the skin since the skin is very much the aesthetic. These are the working guts of the building, communications/wiring, plumbing, air handling, people moving. Ineffective services can cause buildings to be demolished early, even if the surrounding structure is still sound. 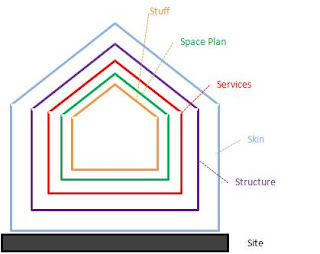 The space plan represents the interior layout – the placement of walls, ceilings, doors, etc. As buildings are re-purposed, as fashion changes so can the interior quickly be reconfigured. The appurtenances that make the space useful for its intended purpose. Placement of tables, chairs, walls cubicles, etc. In further articles, I will develop this theme in 2 directions. First in thinking about how data can affect the way that retail organizations can think about their layout and organization (shearing at the Stuff/Space Plan layers of both brick and mortar and web stores. Second in looking at Enterprise Architecture through the lens of shearing layers – by analogy with Brand’s writing and thinking.